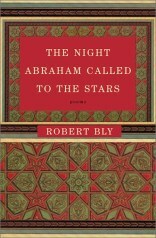 Robert Bly’s collection of poems, The Night Abraham Called to the Stars, presents his characteristically alert, daring and personal verse, only this time in the ghazal tradition. In an essay that accompanied one such poem in The Minneapolis Star Tribune, Bly wrote: "the ghazal . . . began as a love poem in Arabic in the 10th century, and the word actually means ‘love poem.’ Since then the subject matter has broadened and the ghazal has become the major poetic form in a number of languages such as Urdu, Farsi, and Hindi." The book jacket’s copy states that "in the ghazal, each stanza is an independent poem, so the writer is able to shift landscapes. One stanza may have a reference to myth, the next a meditation on conscience. . . ."
The poems point, perhaps obliquely, to Bly’s many translations. In fact, in a somewhat curious book design decision, all the poems in this book occupy the right-hand pages, while the left side remains blank. It is as if they held in the "fertile bareness" (Wallace Stevens’ phrase) the specter of an original text that has crossed the threshold into being. The stark conceptual formality suggested by this typography, however, quickly becomes subsumed into Bly’s athletic leaps of language, imagery, and feeling and the uninhibited energy that powers the pages forward. The ghazal is a highly structured form made up of 36-syllable units divided into two 18-syllable lines. Bly has said that because lines longer than 12 or 14 syllables don’t work well in English, he opted for three 12-syllable lines. To the stars? He cried to Saturn: "You are my Lord!" . . .
Bly is reminding us that the Jewish Abraham could not have said, "Yahweh, you are my Lord," because the first Jews could not say God’s name out loud. This cry to heaven reflects the human instinct and genius for finding (or imagining) patterns in chaos, which goes by the name of making art. The human voice, when calling to the stars, moves vertically until it rebounds off the stars and spreads horizontally, like water splashing on a table. Bly has expressed this thought before. The "spirit" moves upward and resembles fire, he has written, while the "soul" descends downward, like water. It is a measure of the book’s fullness that both spirit and soul receive equal weight . . . and lightness here. Name toward God," Iseult said. "Then a badger ran past. When I said, ‘Oh badger,’ I fell to earth." The sense is that the badger humbled, or perhaps astonished Iseult back from the sometimes detached aspirations of spiritual longing and returned her squarely to both earth and herself. Actually, Bly uses many animals in these poems; the donkey, the oyster, the crow and various other birds, fish, the cow, and horses among others, many others, in their innocence, their instinctiveness and their mortality, pointing to the soul’s gravity. Riding for years, but we’re still only a day from home. This "thirty years" may not represent compressed or "fairy tale" time. It often takes a man or woman, after one trauma or another, that long to regain the capacity to love and to feel. Plato wrote by the light from sharks’ teeth . . .
Plato, in love with the novelty of abstract thought, must have felt relieved to realize that "shark tooth light" was only a metaphor. And a moment later find themselves barefooted in the grave. . .
Chaplin integrates the essence of comedy and tragedy, and these lines ask us whether a man eating his shoe is funny or sad. Of course it is both. It’s hilarious in a wholesome slapstick kind of way, and heart wrenchingly pathetic in its dumb futileness. The doubled grief of the lovers, watching their own and their beloved’s life race by is undeniably sorrowful. Yet one thinks of Dylan Thomas’s line, "Though lovers be lost love shall not," from "And Death Shall Have No Dominion," and finds comfort in the thought of love’s collective joy and enduring rhythm. A humpback, and they’re looking for a wife for Cezanne. It’s hard for them to say, "So be it. Amen." It’s all right if we tumble down the falls. I remember how many lambs died on the farm. Our desires reform themselves overnight anyway . . .
Again, the leaping throughout these ghazals is astonishing. My affections were stuffed into the giant’s mouth. The green logs. You could not have saved me. Many enter romances and/or marriages with the hope and expectation that the relationship will "save" them. In the end, a "marriage" is not a ride, but a long journey toward recognizing and loving another and one’s own individuality and loneliness. In the end, poets and their poems can only save themselves. To be saved or murdered, has made me fierce. Wave their arms and sink into the cold Atlantic. Our desires reform themselves overnight anyway.